Well, I've been insanely busy lately but I figured I'd post quickly about the latest additions to our farm. 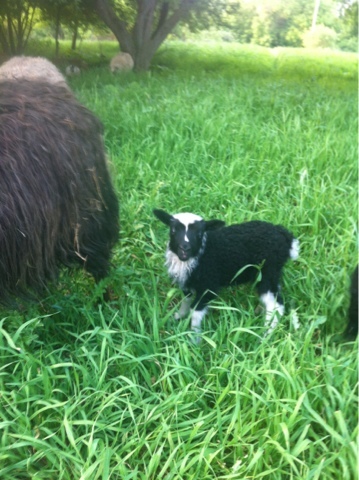 Last week Nance finally gave birth to a leggy single moorit ram. He's adorable and gawky and hilarious to watch walk. I admit I was a little disappointed since I plan to send all rams off to freezer camp this fall and this meant I only had one more chance for a ewe lamb. Well, Blair didn't disappoint! She gave birth to two adorable little lambs, a strong and spunky spotted ewe lamb with some serious chrome, and an adorably scrawny and wimpy little solid black ram. They're so cute together! 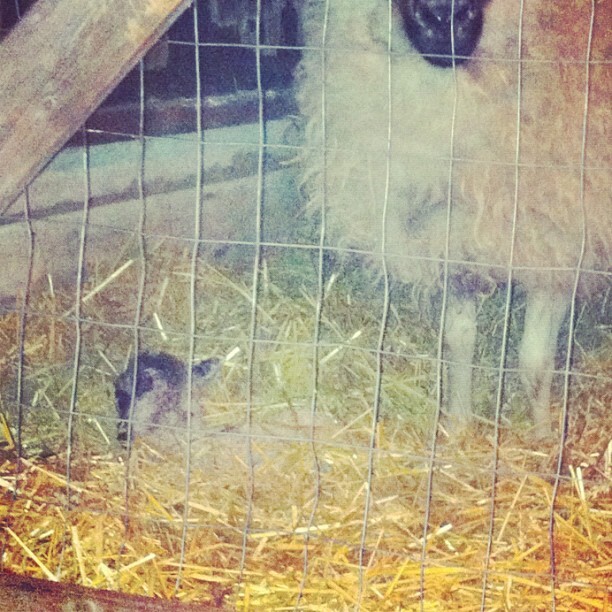 In between the lambing ewes, I had another surprise greet me in the barn. One of our chickens, who we have repeatedly had to kick off a nest, had apparently been sneaking back to it to incubate her eggs. I walked in the morning after Nance lanes to find six baby chicks! They're super cute, though we did (literally) lose one yesterday. It was there and then it wasn't! I guess that's how things go on a farm sometimes. So. I'm posting from my phone which means this isn't going to be very nicely formatted, but here is your daily dose of cute! Now, I know the first few days of a lamb's life can be a roller coaster, but I never thought I'd see such an intense little newborn lamb! 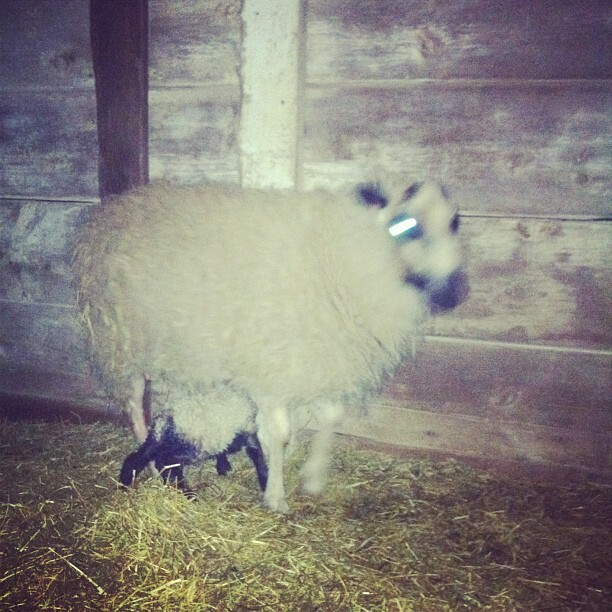 Brighid, my one winter ewe (meaning she's only one year old herself), has given birth to a beautiful and incredibly strong little ram lamb! I'm actually sitting in the barn right now (hooray for wifi! ); Nance and Blair are convinced my laptop is edible and Brighid and her little boy are tucked away in a lambing jug with molasses water and alfalfa hay. I was just drifting off to sleep, with the window cracked ever so slightly, when I heard the quietest nudge of a baa come from Brighid out in the field. There is this seriously fantastic sound that mother sheep make to their babies: something between a baa and a grunt, but with all the softness and gentleness in the world. Brighid sounded exactly the way her mother sounded when she was born! Of course I was filled with an icy adrenaline burst immediately. I grabbed my sweater and slipped on my sandals and dashed out the door with a headlamp. When the lamplight hit the barn entrance I saw four little sets of eyes reflecting back at me, where there are usually three! Brighid had not only birthed the little guy all on her own, she had cleaned him off and had mastered the art of shoving him back to her udder where he appeared to be happily, and strongly suckling away, tail wagging the entire time while she cleaned his little bottom! Of course, it's possible he was just trying to suckle. I'll have to watch him over the next several hours to make sure he's looking perky. I can't believe how well formed Brighid's udders are for a one winter ewe! I'm pretty sure I'm not making a ton of sense right now, but I'm also pretty sure you understand. I hope everyone else has a nice sound night of sleep. I'm sure I won't, especially since this super-big-bright-full-moon ('tis a broad brecht moonlecht necht tenecht!) has the raccoons, coyotes and even the foxes crying tonight. Super creepy! I'm on high alert, as, I'm sure, is Brighid!